T his is a special univers. 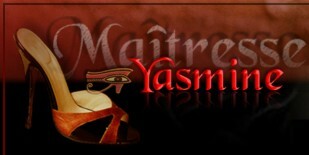 The very special univer of Maitresse Yasmine. From when you choose to go into it, you must know the rules and how to follow them. W ho is Maitresse Yasmine? For ordinary peoples an introduction looking like a biography would be a good answer to this question that is near of the insolence. D o we have to say that Maîtresse Yasmine doesn't have to define herself to anybody, nor to reveal herself before even a meeting? If such were your hope by reading these few lines, forget that, as well as the reading of this prologue of which you will not be able to seize the basic meaning nor even any secondary meaning. I n this context, the only thing you need to know is that Maitresse Yasmine is Maitresse Yasmine. Any other request about Her would be insolent... Unless herself allows you to do so... An extremely rare privilege but which remains possible. S o, on Her originality, you must ask no question before She allows you to speak to her. A quick look to one of her photographs is enough to affirm her singularity in what she is of more outstanding: a sophistication in the intransigence and a permanent requirement for excellence in any relation initiated with her. O nes which did not understand and immediately not integrated this basic precept doesn't deserve that a mistress worthy grant to him a few single moments of her invaluable time. That statement, a small not-exhaustive list of evocation-impressions can delimit part of the sphere of activity, field of attraction of Mistress Yasmine: Charming dark glance, interminable beats of lashes, evocative squealing of black nylon, shingling riding crop, ankle cambered, waving hair, proud wearing of head, vermilioned pulpy lips, emanations of perfume enivrantes, long nails glowing, varnished stiletto heels, silks and laces indented, jarretelles inaccessible, seams impeccably plated behind the calf, smile enigmatic, bitter-sweet thoughts, unforeseeable initiatives, punishments machiavelic.